Sorry that I’ve been a bit absent for a few days, I have had a lot going on at home. We had a water pipe break and that comes with all sorts of stress and drama. But, back to what makes us all happy – food, right? 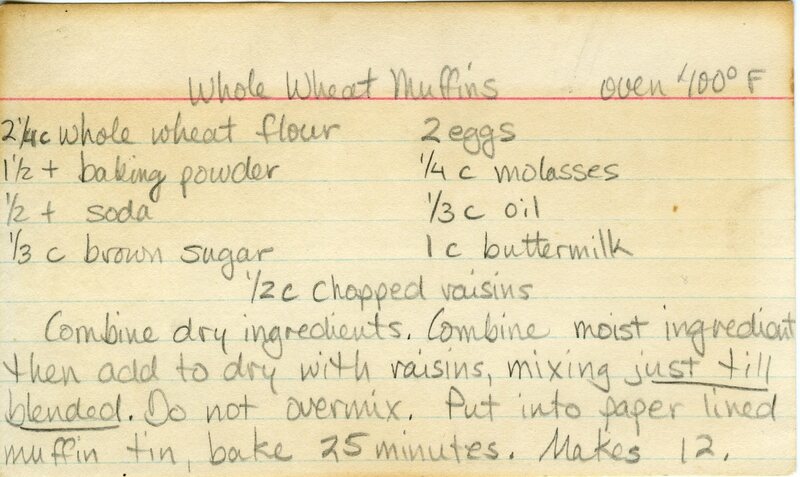 Whole wheat muffins are good for you and tasty. I hope you’ll try them. Combine dry ingredients. Combine moist ingredients and then add to dry with raisins, mixing just til blended. Do not overmix. Put into paper lined muffin tin, bake 25 minutes (at 400). Makes 12.